This 18 oz. 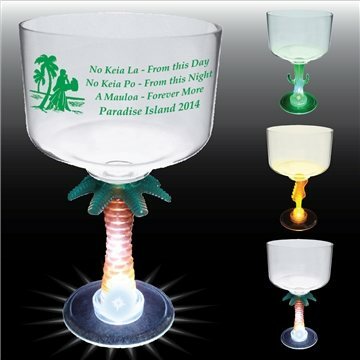 margarita glass has a novelty stem that lights up with the push of a button. Choose from a blinking effect or constant glow. Alicia did a great job. The items were exactly as described and the price was right! Thanks, AnyPromo! Well done! The quality is far superior than similar items from other companies and the cost is unbeatable. Great product. Not just a great job on the order but it shipped out quickly. Purchased one, our logo surely stands out!